Tom started his replica by removing the drip rails, door trim, door handles, and parking lights from an AMT Baldwin-Motion Camaro body. He also drilled out the fender running lights and removed the ends of the rear spoiler as had been done on the actual car. After creating the exhaust outlet in the right door, he added covers to the headlight openings and door handles. He then added rub rails down each side. After enlarging the wheel openeings, Tom extended the rocker and quarter panels. The rear bumper is the original AMT kit part, but the full-width front bumper is from a resin kit Tom purchased on Ebay. Tom added the scoop to a flat hood from his parts box. Photo-etch nuts and bolts enhance detail throughout the entire car. 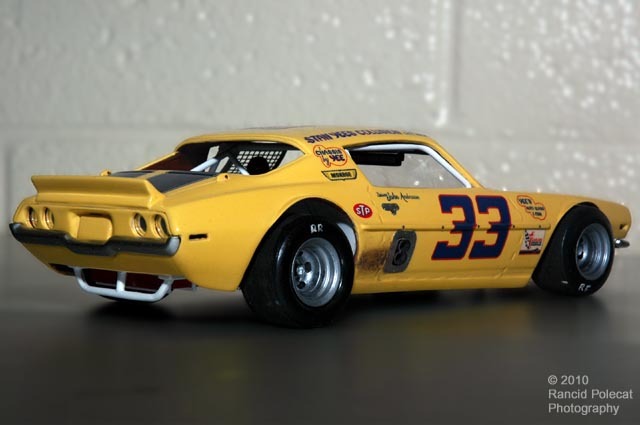 Bullring Graphix body decals are sealed with Tamiya TS-13 clear over the Rustoleum Summer Squash Yellow paint.